We all know how to blow up the first Deathstar: Fire a couple of proton torpedoes into the thermal exhaust port. It's ray shielded, so only torpedoes will do. To do this, the Rebel pilots had to fly down a VERY long trench, where they were vulnerable to fire from any TIE fighters to the rear. In fact they were so vulnerable that most of the pilots on this run were blown up once the Empire forces started responding to the attack. This battle is in space, so the fighters can, if necessary, come to a dead stop and hold their position while firing. Also, when Luke fired his torpedoes, they took a 90 degree turn and went straight into the port. So the torpedoes didn't have to be fired from in the trench. A fighter could have easily flown directly at the exhaust port, firing torpedoes multiple times on approach and, if not under fire (or if protected by other fighters), could have actually stopped and taken time to target the exhaust port before firing. Is there any valid in-universe reason that the pilots had to fly down the trench before firing on the port? And if there is, is there any reason they had to enter the trench so early? Just for reference, here is the briefing scene on YouTube. There's no explanation given for having to fly in the trench. The first is that the concentration of weaponry designed to defend from space attacks is much higher above the surface of the trench. Weapons were placed in the trench specifically to defend it, but that was only a small fraction of the Death Star's firepower (excluding the main laser cannon). Attacking from above the trench would have exposed the small fighters to a larger amount of defensive fire. Coming to a dead stop to steady their aim in such an environment, as you suggested, would have made them literally sitting targets, and would have almost certainly resulted in near-instantaneous obliteration. The second issue is the tractor beam. Small craft such as x-wings would likely have been easy targets for the tractor beam. They were ignored when they seemed to be providing general cover fire, and once they were inside the trench they would likely have been untargetable by the tractor beam. However, if it became clear that they were the real point of the attack, and were focused on a weakness within the Death Star, it would have taken very little effort to use the tractor beam to simply smash the Y-wing and X-wing craft against the surface of the Death Star. Out of Universe, Lucas has stated that he was inspired by a scene from the 1964 British Film 633 Squadron, as well as the 1955 film The Dam Busters. In The Dam Busters, Royal Air Force Lancaster bombers fly along heavily defended reservoirs and aim "bouncing bombs" at their man-made dams to cripple the heavy industry of the Ruhr. Some of the dialogue in The Dam Busters is repeated in the Star Wars climax; Gilbert Taylor (Star Wars cinematographer) also filmed the special effects sequences in The Dam Busters. In the finale of 633 Squadron, the squadron's planes fly down a deep fjord while being fired at along the way by anti-aircraft guns lining its sides. Lucas has cited this as his inspiration for the 'trench run'. A Long ago time ago, on a operating system now far obsolete, there was a game named X-Wing. The last mission was the Trench run (you could see some gameplay here and here). If I remember correctly, moving away from the trench made you vulnerable to hit from turrets as a flying Greedo in a Solo family reunion. General Dodonna describes that the Death Star was designed to fight against a direct assault by large warships, they did not figure that small one-manned fighters would be a threat to it. 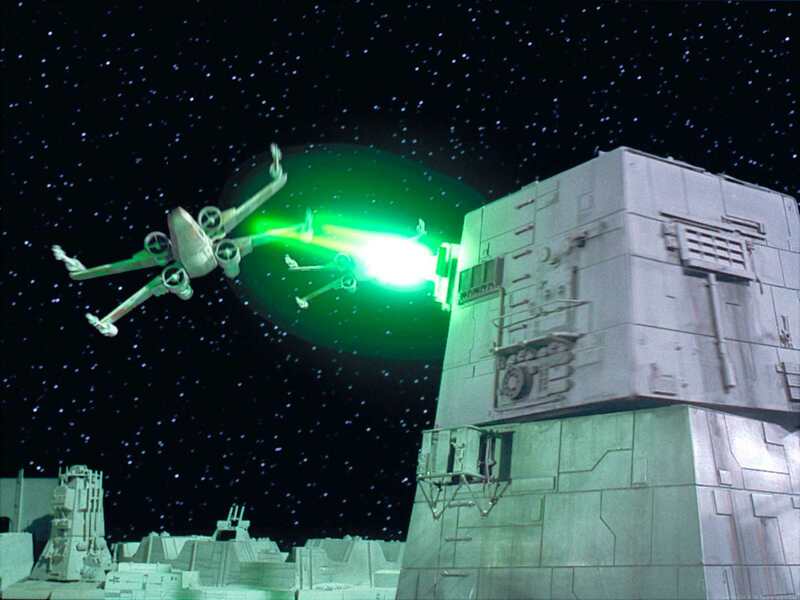 Most likely the Imperial designers figured that the Rebel warships would attempt to approach the Death Star's superlaser disk cannons from the far side of the station (to avoid being fired upon by the superlaser cannon) and travel in low orbit towards the superlaser cannon where the Rebel warships would use their turbolaser cannons to destroy the superlaser disk cannons. I believe the Imperial designers of the station screwed up with the small thermal exhaust port because they would have focused most of their attention on protecting the superlaser disk from attack by warships that could fire turbolaser blasts at the superlaser cannons on the disk. Also remember that there were multiple exhaust ports, this was a small thermal exhaust port that was below a main exhaust port that did not have any design flaws. Remember that the Death Star had tractor beams to draw in small starcraft, like it did with the Millenium Falcon. My one question that I would ask is why didn't the Death Star crews use their tractor beams to draw the Rebel starfighters? The most likely answer is that the Death Star crew was caught off guard by a surprise attack by Rebel fighters when the Death Star crew was planning for a direct assault by Rebel warships. The Imperial fighters did not have their crews ready - as Darth Vader orders an Imperial officer to get the crews to their fighters. In real-life battles tactical planning errors can cause disasters in terms of timing - in the real-life attack on Pearl Harbor, the American forces on Hawaii had prepared for sabotage, but not fighter attack, their flak guns couldn't do it, the American fighters were not ready for take-off. The Pearl Harbor example shows how tactical planning errors by defenders cause timing delays, and that can cause catastrophe. The Imperial officer who tells Darth Vader that the Rebel fighters are so small that they are evading the turbolasers sounds exasperated, because as Dodonna indicated, the Imperials were expecting a warship assault. As mentioned above, the exasperated Imperial officer who informed Vader of the Rebel fighters evading the turbolasers, appears to have spoken with the turbolaser crews who told him they can't destroy them on their own. Darth Vader however appears calm because he knows that the Death Star has squadrons of fighters to fight the Rebel fighters. 1) Diversion: The X-Wings and probably a significant number of the Y-Wings created a diversion by drawing in the TIE Fighters to attack them. Meanwhile a group of Y-Wings broke away from the main group and headed for the Exhaust Port. They approached from a distance away, so as not to make their target seem obvious so as to avoid drawing the TIE Fighters after them. 2) Trench: minimal firepower ability by turbolasers and chasing TIE Fighters: By going into the trench, only a few turbolasers could fire at the fighters in the trench, and only a few Imperial fighters could chase directly behind them. Plus the Imperial fighters would be unable to easily chase them from directly behind would need coordination with the turbolaser gunners in the trench to avoid friendly fire as they chased the Rebel fighters. Plus even if the Imperial fighters entered into the trench to chase the Rebel fighters in front of them they would be easy prey for a group of Rebel fighters following behind them. Again returning to the conversation between the Imperial officer and Vader. The Imperial officer tells Vader "We count 30 Rebel ships". During the TIE Fighter attack we see that Rebel fighters are being destroyed by the TIE Fighters. By the time of the trench runs by both the Y-Wings and the X-Wings, there appear to be very few Rebel fighters left even though the main TIE Fighter squadron appears to have been destroyed. Also the Rebel fighters do not know about incoming TIE Fighters because the Death Star appears to be jamming signals being emitted from the TIE Fighters. The Rebel base was able to detect signals of the main squadron of TIE Fighter's but for some reason does not detect Vader's squadron of his TIE Advanced x1 and two TIE Fighters. Perhaps Vader's squadron signals got mixed up with signals being emitted from the Rebel fighters, as Vader's squadron perhaps stalked their trail. Or the Death Star crew found a way to jam the signals from Vader's squadron from being emitted to the Rebel base. This is feasible because Vader was obviously coordinating with the Death Star's turbolaser crew when the trench's turbolasers would cease firing on the Rebel fighters in the trench when Vader's squadron approached the trench. That coordination that occurred between Vader's squadron and the Death Star's turbolaser crew was something that Rebels did not plan for. That is why they switched all power to their front deflector screens. One of the younger Y-Wing pilots is completely confused by the sudden stop of the turbolaser fire, but the veteran Y-Wing pilot Gold Five quickly realizes that the most likely reason for this is because the turbolaser crews want to avoid friendly fire on Imperial fighter, and tells the other pilots to stabilize their rear deflector screens. That is when everything goes wrong for the Rebels. The remaining X-Wings are likely too far away to reach the Y-Wings in the trench in time to save them, as they had been fighting the larger TIE Fighter squadron away from the trench as a diversion. Thus due to the X-Wings' diversion tactic with the main Imperial fighter squadron in combination with Vader's swift recognition of the several Y-Wings breaking off from the main group, the Y-Wings did not gain the defensive fighter cover by the X-Wings that could have easily followed behind any Imperial fighters chasing the Y-Wings in the trench. But the Y-Wings went ahead with the trench run anyway, there was no time for the Y-Wing pilots to spare reorganizing their attack run as the Death Star was nearing its orbital position to fire on Yavin IV. With no fighter cover by the remaining X-Wings and no time to spare, the Y-Wings went near-suicidal straight ahead. Gold Leader wants room to maneuver from incoming fire from the TIE Fighters by breaking out of formation and gets nervous - Gold Five is focused on reaching the Exhaust Port in time, and tells him to focus and "stay on target". This is probably because Gold Leader's targetting computer may be unable to calculate the direction the torpedo must follow to go into the Exhaust Port if he he continually attempts significant maneuvers in the narrow trench, which would also be dangerous with other fighters near them in the trench (as Vader's wingman found out the hard way). The X-Wings' trench runs followed much the same. They were all but out of time, there was no time to substantially re-plan the attack. General Dodonna told the Red leader to take ""keep your group out of range for the next run" - i.e. don't head to where the Y-Wings where and where the Imperial fighters are, to keep out of range of the fighters' fire and keep out of range of turbolaser fire so that the fighters would have physical space between them and the three Imperial fighters. Red Leader knew the three Imperial fighters would catch up with them, and told Wedge, Biggs, and Luke to be on the lookout for them. The big question and almost unjustifiable plot error is that I don't know why Biggs, Wedge, and Luke were unable to go into the trench and draw out Vader's squadron or at least his wingmen - there was no reason for them to make the same mistake that happened with the Y-Wings of the X-Wings being in the wrong place after engaging another group of fighters. The only possible explanation is that Wedge or Biggs thought they saw the fighters in a different location from where they were, and were again a bit too far away. But they were not too far away from Red Leader, as it can be seen that Vader breaks up his squadron's formation as he chases Red Leader's X-Wing, while one of the wingmen TIE Fighters appear to be chasing the other X-Wings as, a TIE Fighter is seen flying below Red Leader's X-Wing after Vader's shoots the fatal blow to Red Leader's starboard engine. Han Solo's Millenium Falcon struck a lucky blow to one of the TIE Fighters, one of them panicked, the rest is history. Whew! That was long, but that is what I see as happening and why the trench run occurred and why it occurred the way it did. *Summary:* tactical screw ups by both the Imperials and the Rebels, issues of physical space and location of weaponry on the Death Star (more turbolaser turrets on the surface less in the trench, few Imperial fighters able to fit in the trench to pursue from directly behind), roles of physical distance and timing. DODONNA: The battle station is heavily shielded and carries a firepower greater than half the star fleet. It's defenses are designed around a direct large-scale assault. A small one-man fighter should be able to penetrate the outer defense. DODONNA: The approach will not be easy. You are required to maneuver straight down this trench and skim the surface to this point. The target area is only two meters wide. It's a small thermal exhaust port, right below the main port. The shaft leads directly to the reactor system. A precise hit will start a chain reaction which should destroy the station. Given the angle of the required precise hit, you had to be in the trench in order to successfully get the chain reaction. Remember that before Luke another pilot fires and just hits the outer wall, failing to get the exact angle he needs. I don't have any canon backup, as of yet.. But I believe the trench let them take advantage of one of the less defended points (where they entered the trench) and then stay in a confined area that limited the number of Empire ships that could attack them, as well as avoiding most of the turrets, since they weren't designed to be able to shoot AT the Death Star. Basically, it gave them cover. In the trench, almost any shots taken at them could hit the Death Star, so fixed turrets mostly couldn't fire there; out of the trench, normal rules applied. Remember, too, Lucas wrote a lot of the space combat using WWII Air combat as a model. In effect, converting to WWII, they were flying down along a river (in a gorge/valley/trench/whatever) or some such, to hit the weapons depot. The anti-aircraft batteries weren't created with the assumption that someone would be a nutjob and fly that low, or in such cramped conditions, so they have very limited ability to aim there. See: The Bridges @ Toko-ri. What if the side with the exhaust port was opposite or nearly opposite the rebel base? It probably was, given that they spend like 20 minutes in the trench. If they were to fly straight at the port, it would first require going all the way around the death star from a "safe" distance at least away from the ground turrets. It could have taken hours (it was the size of a moon), and by that time Imperials would have picked them up and deployed enough TIEs or other ships to completely take care of them. Ultimately, there's not enough information to know, but if we can throw out some plausible scenarios to justify the film, we can at least preserve our belief that the trench run remains one of the most iconic space battles of all time. I don't see it as far-fetched to assume the outer surface was so heavily defended that any ships would have been obliterated nearly instantly if they ever faced downward long enough to line up a shot. There has to be a difference between hitting a perpendicularly flying and looping ship than one standing still right above you, taking aim. It could be a case of "in theory, it could work, but in practice it wouldn't." Not to mention the station had a manned crew of around 7k-8k TIE fighters, a numbers advantage mitigated by confining the space to the trench. There's also the possibility of some sort of anti-missile defense that could shoot down projectiles from range. Assuming these were not present along the walls of the trench (a plausible oversight since missiles should only be approaching from outside and not from within), the time-frame to shoot down a missile that enters its trajectory 4 meters above its cannon as opposed to one several hundred meters out is a large difference. This is also assuming such a defensive mechanism is located around the vent instead of on the surface of the Death Star, in which case it would not even be able to strike down an incoming missile from the trench. Why enter the trench from so far away? The rebel fleet was on a time limit; they only just managed to kill the death star in time before its laser destroyed Yavin IV. The vent could have been located almost anywhere relative to the laser. It's actually very logical, given how our locomotives work today, that the exhaust would be at the "rear" of the station, while, logically, the main artillery is at the front of the station to aim. This means that rebels from Yavin IV had to traverse the entire circumference of the station. Unless a surprise attack manages to approach the rear of the station unawares (implausible that the station wasn't equipped with effective radar equipment), then any battle scenario would have required fighters traversing the circumference of the station to attack from the rear. The only path safe from the bulk of the surface fire, presumably also the trajectory beam if that were a threat, and certainly from the myriad TIE fighter fleet, was through the trench. This would also be by far quickest path to the exhaust, as the circumference is smallest at the surface of a sphere. Was the trench safe? Obviously not, but from a design perspective it is very reasonable to assume that the station was much better equipped to deal with threats above the surface than in the trench. If your odds of success in the trench are only 1%, then presumably flying 10x as far around the circumference of the station under 100x heavier fire would yield a much lower chance of success--not to mention Yavin IV would have been blown up in the interim. Consider the single casualty above the surface of the station a result of luck, or simply a matter of the fact most of the rebel ships spent the bulk of their time in the trench, meaning they are more likely to die there, or just a fault of Hollywood. Nevertheless, from a design perspective, it is all-too logical to assume the trench was less defended than the surface, and as a corollary that the exhaust was better protected from perpendicular assault than parallel; that the exhaust was located at the rear of the station, making the trench the fastest route around a 160km diameter sphere; and that no matter where the exhaust was located, the rebels did not have the luxury of choosing where or especially when they would attack, as the Death Star threat was imminent. The goal would have been to reach the Death Star, distract the surface defenses from your plan of attack, while select squadrons entered the trench as soon as possible to begin their approach on the goal. The Death Star was rotating when it arrived at Yavin - flying along it's circumference in the direction of rotation (or preferable in the opposite direction) would give a nice line-up for a shot at the trench. Coming to a dead stop is not good enough here. The stolen Death Star readout indicates that the exhaust port was near the "North" pole of the Death Star, above the CDCBS (the laser). The Death Star's approach towards Yavin IV angled the CDCBS towards the base as the battle station rounded Yavin. The Rebel attack group took a direct approach from the moon base towards the Death Star. Since the Death Star had not yet rounded Yavin but was angled towards Yavin IV, this meant that the Rebel group approach brought them in slightly "West" of the CDCBS. Since the Death Star is equipped with ubiquitous surface turbolasers, the small Rebel fighters were forced to close the distance quickly, to avoid overwhelming Imperial fire. They were then close to the surface of the battle station. Due to the vector of their attack, they were not close to the exhaust port. To get within proton torpedo range of the port without being fired upon by the turbolasers, they flew through the trench. They still had to deal with TIE fighters and some turbolasers, but considerably fewer than if they had flown outside the trench. Once within the trench the Imperial forces WOULD have had a much harder time shooting the Rebels. Since they would be at risk of not only hitting Darth Vader's squadron, but also of the Death Star itself. Perhaps, the Death Star's architects assumed that the exhaust was safe, due to the relatively heavy artillery from above, and as such avoided putting significant defenses in the trench in order to disguise its importance. I don't have a completely substantial and well founded idea, but here is what I have come up with. If you watch the entire Death Star Trench scene only one ship is ever taken down by the large surface cannons and even that one is questionable (you know the fat rebel). Clearly the surface cannon posed little threat to the fighters and entering the trench could have been done at a much later time as not to face fire from the cannons within the trench, which I might add also, did not take out a single fighter. Also the photon torpedoes had some sort of homing system on them otherwise they would not have been able to make that 90 degree turn down into the exhaust port so the whole trench run seems very pointless. Anyways that is just my opinion based upon what I observed in the scene. The further away X-wing is from firing gun, the harder it is to hit due to its changing speed vector and blaster shots time to target (remember Laser cannons are not firing rays, but rather laser ignited bolts of superheated plasma, accelerated by mag-field to limited velocity. Also, this enables magnetic shielding around hull to de-magnetize plasma bolts particles and thus scatter plasma energy preventing hull penetration. Shield is not as effective against kinetic weapons. Proof is volleys of Concussion missiles destroying shield generator of the Super Star Destroyer in ROTJ). Exhaust port was heavily defended and shielded from the surface, but not the trench. And torpedoes had to be used due to the "ray shielding". Fighters were running the trench in tight formation so the wingmen would use their deflectors and armor to soak some fire and protect the lead targeting with torpedos. Once bounced from the rear by TIEs, they had a choice to either stick with the lead as cover, or to brake off and go offensive. Being flat out at max speed with all energy transfered to engines, trying to brake off and reverse behind TIEs would probably leave them too far behind to assist the lead, which would be than defenseless against rear shots. Ever noticed any thrust vectoring or multiple maneuvering thrusters? That's cause there are none. Yet the crafts are able to levitate. That's thx to "space generating propulsion". Tech used is based heavily on "inflation" phenomenon. Craft is generating "space" below it to counter gravity. In space flight craft induces sort of "warp tunnel" in which there's space rapidly generated behind it, and contracted in front. When manevering, craft use no thrust vectoring, but rather bend "warp tunnel" In the desired direction, producing flight mechanics resembling flight in atmosphere. Most fighter designes use "wings" as antenna to generate and direct "warp tunnel" used for propulsion, though some use entire hull. X-wing opens its S-foils to increase agility, by enabling better warp vectoring with each wing. In closed position, foils provide superposition effect, increasing warp effect greatly thus enabling hyperspace travel. Hope my explanation was ok. This thread is extremely old but I was thinking on the same topic when I re-watched the old films. The best theory that I could come up with is that the targeting computer needs as much time as possible to calculate a firing solution. The longer you are in the trench, the longer you are locked on to the target, the more likely the shot will be on target. Isn't it possible that the exhaust port(s) is shielded against any attack from 'above' – ie directly down into the reactor/shaft. This would make sense when designing the station, otherwise surely any Rebel ship (one man or capital-ship size) could just pop off a dozen or so proton torpedoes at stand-off range and boom. Along with the rest of the station's defences, the exhaust port must be designed to withstand the 'direct, large scale assault' General Dodonna mentions – and the rebels find the one (pretty elaborate) way in. In his briefing, he specifically says the Rebels pilots are required to manoeuvre straight down the trench and also that the approach will not be easy. Although he never mentions it, this sounds to me like a specific attack / flight pattern to negate outward facing shields. Would love to hear thoughts if anyone is still reading this (fascinating) thread. Why fly in the corridor so long to destroy death star? A New Hope: Why doesn't the Death Star scramble more TIE fighters? Can all proton weapons penetrate shields? Why? What damage did Red Leader's torpedoes cause to the Death Star? Why did the Snow speeders attack the AT-ATs from the front? Why were shields on the Rogue One X-Wings not turned on or working? Did any non-rebels regularly fly X-Wings?